– Establish benchmark data regarding bat activity and monitor trends thereafter. – Gather information regarding diet, behaviour and use of habitat. – Produce distribution maps for the 3 species of bat being studied. 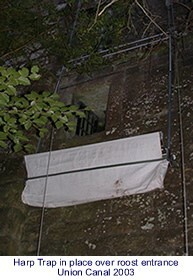 – Locate, monitor and protect bat roosts found in the study area. – Contribute towards Local Biodiversity Action Planning. – Raise public awareness of bat related issues and improve the image of bats generally. To help us in achieving these objectives we also got involved with Habitat Assessment, Insect Studies, Training, Public Walks/Talks and wider Public Relations activity. Note that BaTML was a non-profit making organisation and the money generated through our activities was used directly for the benefit of our research and/or bat conservation generally. BaTML Publications was the annual journal produced by the BATS & The Millennium Link (BaTML) project. The core objective behind this journal was to make available, within the public domain, as much detail as possible of the work carried out by or in association with BaTML. In addition to this, however, we were happy to consider including material from other people or organisations relating to bat studies and in particular the areas of study we are involved with.